Andrew, Paige G., Susan M. Moore, and Mary Larsgaard. Chicago: ALA Editions, 2015. 152 p. $62.00. The handbook under review provides catalogers of cartographic materials with a lucid and concise guide to implementing and integrating Resource Description and Access (RDA) standards into cataloging workflows. While written specifically with cartographic resources catalogers in mind, this book offers one of the best overviews of the ways RDA standards are similar to AACR2 standards as well as the crucial differences between them. Catalogers of all stripes will find the first chapter of this book, “The Past is Prologue,” very useful. Traditional cataloging sought to create relationships between objects that exist in the bibliographic universe. In print-based resources such as card and union catalogs, catalogers could achieve this aim by describing the physical characteristics of the item in hand and assigning to it standardized data such as subject and name authorities. These standardized data could be applied to multiple objects to link them. As the bibliographic universe expanded to include non-print media and print-based resources were replaced by other technologies, the relationships created by traditional cataloging were still important but more and more difficult to discover and use. Conceptual models such as Functional Requirements for Bibliographic Resources (FRBR) and Functional Requirements for Authority Data (FRAD) were developed to provide a foundation for descriptive standard that would improve upon AACR2’s strengths while abandoning its weaknesses. RDA is the result of many years of critical thinking about these resources and ideas. One of the beauties of this book is that catalogers do not need to know about the history of RDA to use it. 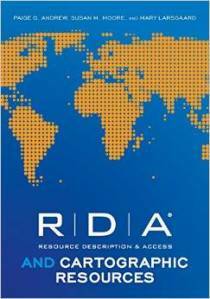 Chapter 4, “Navigating RDA to Describe Cartographic Resource Elements,” is ideally suited for catalogers who wish to begin applying RDA principles to their descriptive work. Of the five chapters in the book, this one provides easy to use, hands-on information to inform cataloging practice. Examples are laid out sequentially according to MARC fields, and admirably demonstrate how the new RDA 33x fields, for example, support more traditional metadata in other MARC fields. It is also rigorously cited to direct catalogers to relevant sections of AACR2 and RDA when the need arises for more information from a parent source. One of this title’s greatest strengths is its generous selection of clearly described and illustrated examples of how to apply RDA standards to the description of cartographic resources. Another is its thoughtful reiteration of similarities between old and new standards of description, which orients the cataloger in familiar conceptual and practical territory while at the same time reinforcing changes to cataloging standards. This guide is particularly useful in showing how catalogers account for missing data with RDA. RDA and Cartographic Resources is an essential resource for catalogers of cartographic materials attempting to understand and applying RDA standards to their daily work. Its five chapters are well-written and superbly illustrated, and the seven appendixes concluding the volume, which include an “RDA Checklist for Descriptive Elements,” “33X Content, Media, and Carrier Terms Examples Based on Different Kinds of Cartographic Resources,” and “Sample Records for Different Cartographic Resources Types,” are invaluable ready references resources for cartography catalogers. This modest volume’s relevance, however, transcends cartographic resources cataloging. Catalogers interested in learning more about the relationship between AACR2 and RDA, as well as how FRBR and FRAD concepts inform RDA standards, are also well served by this book.